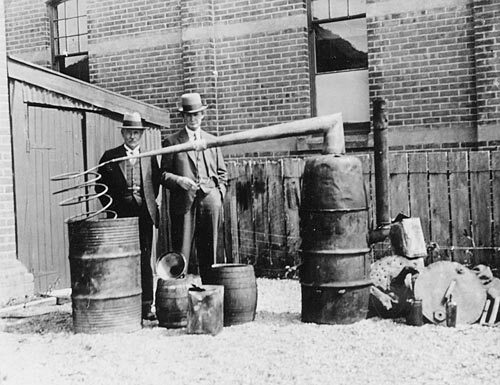 H. S. Cordery, collector of customs at Invercargill, and Detective Sergeant Hewitt raid an illegal whisky still at Ferndale, near Gore, in December 1933. Police charged with enforcing prohibition in eastern Southland frequently raided illegal stills. Cordery was the collector of customs from 1928 to 1935 and was known as ‘Hammer of the Scots’ for his zeal in going after illegal distillers. Image courtesy of S. Young and the Hokonui Moonshine Museum.